We have created a Bible study journal that you can order or print. 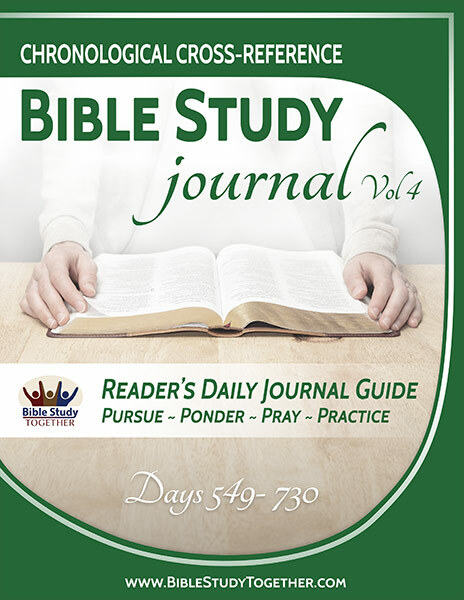 Our journal contains our Bible reading plan, study questions, space for taking notes, and a daily challenge. You can print each page, three-hole punched them, and add them to a binder. The printable Bible study journal is our ultimate tool for people who want to enhance their quiet time by recording their thoughts from each day’s reading, prayer requests, answered prayers, and daily events. This Journal was also designed to be a discipleship tool for church small groups. Each day’s questions are open-ended so they work particularly well for small group discussions. If you don’t want to take the time to print our journal you can order a copy from Amazon. We will be publishing these volumes in 2018 and plan to have all four volumes completed by January of 2019! Why wait? Print now and start today! 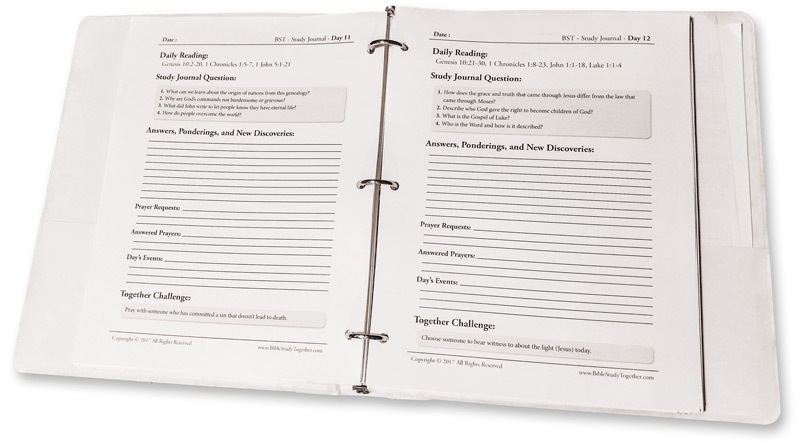 Want to print the Bible Study Journal yourself? As long as you aren’t selling it or redistributing the digital files, you can print our Journal for free and put it into a three-ring binder. Be warned though, there is a lot of pages and you might save money and time by ordering a copy (that’s why we made the printed edition). You can download everything at once by clicking Download Now or you can print any of the Bible study journal pages by clicking the plus buttons below and selecting a day. A PDF will open that you can print. We are extremely excited to get you digging into God’s word and we hope that you will invite others to join you!